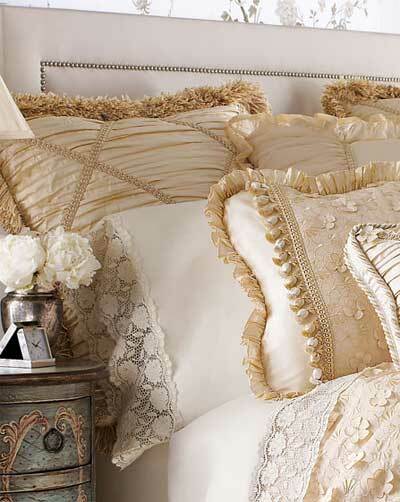 Embroidered duvet covers adorned with “floating” petals are finished with cording. Silk doupioni dust skirt panels have an adjustable 18″ drop; tidy pins included. Braid trim, chiffon ruffles, scallops, teardrop tassels, and plush velvet are among the array of fabulous finishing touches. Beautiful lined, rod-pocket curtains match the duvet covers. This exquisite bed linen design will make you feel like a princess in a fairytale, and the best part is – it is not a dream.